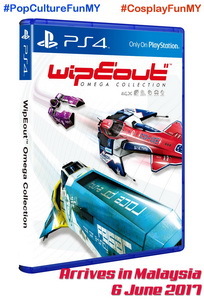 As the pack says “Collection” – expect it to feature all the content from “WipEout HD Fury” and “WipEout 2048”, contains 26 reversible circuits, 46 unique ships, a ton of game modes and some new and classic music tracks!! Oh yea!! Here is the official word from PlayStation Asia. Early Purchase Bonus DLC will be bundled with the initial production of BD Edition. It will be available for download for customers who purchased the Digital Edition during the first two weeks. Below are the details for the bonus DLC. Featuring all the content from “WipEout HD Fury” and “WipEout 2048”, “WipEout Omega Collection” packs in 26 reversible circuits, 46 unique ships, a ton of game modes and some new and classic music tracks. This entry was posted on 24/05/2017 by The Captain. It was filed under Games and was tagged with Cosplay Fun, Cosplay Malaysia, Cosplay-Fun Malaysia, Playstation, Playstation 4, Pop Culture Fun, Pop Culture Fun MY, Pop Culture in Malaysia, Sony Playstation, The Captain, WipEout, WipEout 2048, WipEout HD Fury, WipEout Omega Collection.